To make it in retail, the mantra for success was – Location, Location, Location. Not anymore, though. 2018 saw major big-box retailers like Toys R Us, Bon-Ton closing down and others like Macy’s, Sears and J.C. Penney closing some of their major stores. But, the only way e-commerce threatened the survival of brick and mortar stores is how it changed customer expectations. E-commerce has changed the way customers shop. Gone are the days when you would have to wait in long lines at the checkout counter and be swamped by salespersons trying to get their commission or even worry if the store is open. E-commerce giants like Amazon have enabled shoppers to shop anytime, anywhere all from the comfort of their home. Even Amazon’s attempt at a physical store – Amazon Go and Amazon 4 star store utilizes a myriad of technology that allows customers to make cashier-less shopping a reality. The only way for retailers to surge forward is to adapt to technology that is often thought best left to tech startups. Customer expectations must be tapped into to design an improved store experience. Customers want shopping to be a memorable experience. And for that to happen, the emphasis must shift from the sales to the store itself. Sephora and Nordstrom have opened up stores dedicated to only helping customers with style makeovers and sampling products. The takeaway here isn’t that retailers must open another store exclusively for offering such experiences but to incorporate technology that allows for such experience. BLE beacons, for instance, can help shoppers find their way through the store, interact with products, and get relevant deals and discounts. Cost-effective strategies like QR codes can be used to design a curated playlist for shoppers and NFC-enabled products can increase the post-purchase engagement. While the location of the store is losing relevance, the location of the customer is becoming more relevant than ever. Proximity marketing offers a way to only show contextual content to shoppers that they will deem useful. In fact, 80% of consumers prefer relevant advertisements over other forms of marketing. Nike’s 2018 ‘Just Do It’ advertisement featuring Colin Kaepernick elicited strong reactions from both ends of the spectrum which is going to pay off in the long run. In fact, Nike’s stocks went up 50% from 2017. Not to mention, a poll held by Quinnipiac University showed that 49% approved of the advertisement, the majority of the approvers were within the age of 18-34. Gillette’s ‘The best a man can be’ that openly talks about toxic masculinity has also met with waves of strong criticism and appreciation. While the sales were unaffected, the unprecedented coverage the advertisement received is proof of why bold campaigns should be the norm. 81% of millennials expect their favorite brands to unequivocally declare their support for social causes and build sustainable products. This is not to say that all advertising must be polarizing for it to have an effect. Adidas partnered up with Parlay to create a line of shoes and apparel that does not use virgin plastic and every sale counts towards cleaning up the oceans. Americans, especially millennials, only support brands that are eco-friendly according to some recent data. Instead of duking it out with e-commerce, a lot of retailers like Walmart are expanding their online shopping experience. Using NFC tags and QR codes on digital signage, posters or flyers, shoppers can be easily led to the online store and get free home delivery. The QR-enabled Scan and Go technology is blooming because of the cashier-less experience and the ease of shopping. Top Tip: Designing a poster or brochure with NFC and QR codes is easy with Venngage. This free online design tool allows you to quickly create a mind map, poster or brochure using their ready-to-use customizable templates. Amazon is also branching out in the physical retail landscape by acquiring a retail chain like Best Buy which will probably get a technology makeover just like the Amazon Go stores. Marketers have been seeing the growth of omnichannel retail marketing strategy for the past couple of years but 2019 will see a drastic change. It won’t matter where the sale takes place on Facebook, Instagram or Square. Retailers will have to build several digital touchpoints for shoppers as the shopping experience isn’t going to be linear. It isn’t especially difficult to redirect in-store customers to social media business pages with the help of BLE beacons, QR or NFC. Given that most social media platforms like Facebook and Instagram allow products to be bought without visiting the website, having an omnipresent retail marketing strategy is definitely the way forward. 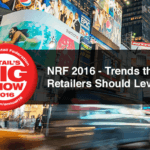 Technology is going to be the common denominator when it comes to all the thriving retail stores. 77% of retailers are going to implement IoT solutions that will give them a better idea of how a customer shops in order to improve the physical touchpoints at the store. Brands like IKEA are also experimenting with Augmented Reality to showcase their products. The iOS 11 and ARkit update has a lot to do with the surge. The IKEA Place app built in collaboration with Apple allows customers to spark joy with a virtual home makeover. BLE beacons and location-based advertising are also going to become equally important with 70% of retailers who plan to invest in the technology. Cost-effective retail marketing strategies such as QR and NFC can serve as a diving board for small businesses who want to wade in and experiment with location-based advertising but don’t want to rack up dollars for cognitive computing or machine learning. Macy’s and Target introduced a new loyalty program that allows customers to shop without a card at the store. Such a program is easily achievable using a QR code or with the brand’s beacon-enabled app. Loyalty programs have also evolved to become more subtle like Nike’s NFC-enabled jersey or H&M’s smart clothing that award points to the wearer and opens up a world of benefits for the shopper. 2018 was the year of personalization and the trend has perpetuated into 2019 as well. So, why not do that with loyalty programs as well? Starbucks allows its regular customers to order their usual without waiting through the app. A beacon-enabled app can drive such personalized experiences inducing customer loyalty. Despite the scandals and privacy issues, data is gravity-defying. Location data, to be specific, is what retailers can and will use to separate themselves from the herd while fending off competition from e-commerce. Technology adept retailers will thrive while those unwilling to adapt will meet the same fate as Toys R Us. Even small businesses will need to step it up. Although customers like to support their local businesses, a digital transformation is imminent. According to Clutch.co, 94% of small businesses will cater to the smartphone culture in 2019. ‘Invisible sales’ that do not involve interaction between a shopper and a cashier will become prominent given the rise of NFC and QR and proximity marketing market in general. What do you think of the retail trends in 2019? Which of these retail marketing strategies will you adopt? Let us know in the comments below. Stay relevant in 2019 with Beaconstac – an end-to-end proximity marketing solution that can cater to your use case. Beaconstac now offers a comprehensive solution which includes – beacon marketing, NFC marketing and QR code marketing.